Canadian opposition parties are crying foul after an inquiry into a political crisis challenging Prime Minister Justin Trudeau was shut down. A Liberal-dominated parliamentary committee has dropped the inquiry, saying its objectives have been achieved. The PM has been accused of pressuring a former minister to help cut a deal for a firm facing a corruption trial. He has struggled to contain the political fallout from the controversy. On Tuesday, Liberal committee members, who hold a committee majority, voted to end the inquiry. They said it had heard from numerous witnesses over the past five weeks who had presented all sides of the matter. 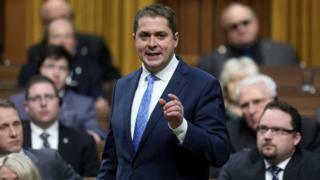 Conservative leader Andrew Scheer accused the Liberal prime minister of "thumbing his nose at every single Canadian", calling the committee's move an "abuse of power" and "an affront on democracy". New Democrat member of Parliament Murray Rankin called it a "transparent effort to change the channel". The former attorney general, Jody Wilson-Raybould, says Mr Trudeau and members of his inner circle spent months trying to convince her that taking engineering giant SNC-Lavalin to trial would cost Canadians jobs and have potential political ramifications. She also says she was subject to "veiled threats", which she believes were made good when she was shuffled out of the attorney general and justice portfolio. Ms Wilson-Raybould said she believed no laws were broken but that the interactions crossed the line of her prosecutorial discretion. SNC-Lavalin is facing allegations that former executives paid bribes to win contracts in Libya under Muammar Gaddafi's regime, which fell in 2011. It has been lobbying for an agreement that would have allowed it to avoid a criminal trial and instead agree to alternative terms or conditions, like penalties or enhanced compliance measures. Ms Wilson-Raybould resigned from cabinet in February. She was soon followed out the door by Liberal MP Jane Philpott, who left in protest with how the government handled the affair. One of Mr Trudeau's most trusted and senior aides also resigned and Canada's top public servant announced on Monday he would retire because a relationship of the "mutual trust and respect" with opposition parties was no longer possible. Opposition parties wanted Ms Wilson-Raybould to return to committee following her bombshell testimony last month . They say questions remain as to whether anything improper took place. Mr Trudeau has denied any wrongdoing by either him or his staff and has said it all came down to an "erosion of trust" between his office and Ms Wilson-Raybould. Opinion surveys indicate that the controversy has caused Mr Trudeau's popularity to slip sharply in the run-up to the election scheduled for October. The vote-rich province of Quebec, where SNC-Lavalin has deep roots, will be central to the Liberals' re-election efforts. Canada's ethics commissioner is still looking into Ms Wilson-Raybould's allegations of attempts at political interference. Earlier in March, the OECD's bribery watchdog said it was concerned by the allegations and will closely monitor the matter.